Before Imatest’s Arbitrary Charts module can analyze an image of a test chart (possibly of your own design), it needs to know exactly what the chart’s design is. This requires information about the chart’s features (the elements present on the chart that aren’t just its background color, e.g. color patches, slanted squares, registration marks, etc). The information required includes both layout parameters so that the features can be located correctly and ROIs generated from them, and reference-value information about the features in some cases, such as the true LAB or RGB value of a color patch. Chart definitions come in the form of JSON-formatted text files which describe the properties of the chart and its features. These files can be created by hand or by a user-defined automated process if you are so inclined to create one. Design a chart comprised of the allowed features in a graphics editing program such as Inkscape or Adobe Illustrator. Measure or record the positions and sizes of all of the features, and convert to normalized units (see below), as well as the other reference values (color values, etc). Create a JSON file by hand with the required fields describing the chart, as described below. The Chart Definition Utility can aid in this process by checking user JSON files for correctness, displaying an illustration of the chart defined by a JSON, and displaying sample ROI from a real image of the chart. 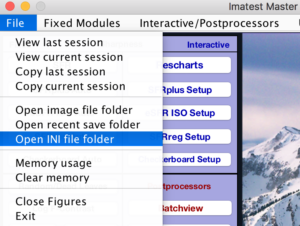 If you have installed Imatest 5.0.0 or newer, you already have some example chart definition files installed on your system. These can be found in the chart_design subdirectory the Resources Directory installed in the same location as the default Imatest INI folder. The easiest way to find this folder location on your system is to select the “Open INI file folder” entry in the File dropdown of the main Imatest window. To analyze a chart, Imatest needs to have a definition of that chart. The following describes the necessary information that Imatest needs to analyze observed images of that chart. The entire width and height of an Arbitrary Chart is interpreted as the background area for uniformity analysis. This excludes areas designated as features or keep-out areas. All fields are required unless marked explicitly as “(Optional)”. Additional fields may be included in feature definitions, but will be ignored. For JSON number types, decimals with values less than one must have a leading zero e.g., 0.25, not .25.
name string Name of the chart e.g., “SFRplus_5x7” Note: Chart names must consist only of alphanumeric characters or underscores, (no spaces) as they will serve as a basis for results file names. aspectRatio number The overall width divided by the overall height, e.g., 1.750. *Note, this number is unit-less. After the background area has been defined, features can be placed on the chart. The Test Charts Module can be used to generate chart features. The following is a set of allowed features that can be analyzed by Arbitrary Charts. Each feature type has its own set of indices, which must start with a value of 1. The rotation of each feature is assumed applied to the feature after it is placed and sized. 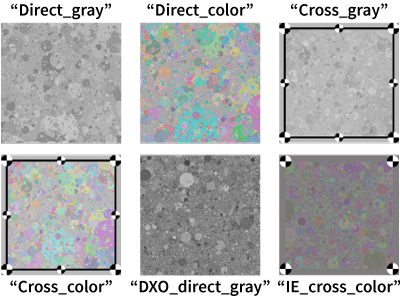 Note: Registration marks on the corners of cross-correlation texture patterns count as part of part of the RandomFieldFeature, not registration marks. They should not have separate entries or count towards the indices of RegMarkFeatures. Note: CircleFeatures are used for chart registration for legacy targets, and used only for registration (they are not analyzed for results). Use of RegMarkFeatures instead is recommended when possible. CircleFeatures are assumed black, on top of a lighter background. Note: When the optional “useForNoisePSD” is marked true, the noise Power Spectral Density (PSD) is calculated for texture-direct analysis. Typically, a neutral gray color patch of 18% reflectivity would be used for this purpose. Otherwise, this can be left as false by default. Note: Registration marks on the corners of cross-correlation texture patterns count as part of part of the RandomFieldFeature, not registration marks. They should not have separate entries or count towards the indices of RegMarkFeatures. The Test Charts Module can be used to generate random patterns. Notes: Keep-out areas are regions of the chart where there may be other graphical features that aren’t defined for analysis by other chart features on this page, but need to be known by the system to avoid incorrectly using the area for uniformity analysis from the background area. This includes graphics, text, framing markers, etc., that should not be included in uniformity analysis. The center, width, and height of keep-out areas are defined like any other Arbitrary Charts feature. Keep-out areas can overlap with other defined chart features with no negative consequence. Many chart features require entry of color values in their definitions, including ColorPatchFeatures, SlantedSquareFeatures, and the chart background itself. Reference color values can be indicated by the combination of a value (usually a 3-long vector of numbers) and a string which indicates an encoding which defines how to interpret the numbers. The following table indicates the allowed encoding types and what their associated value entries must be. Standard RGB color spaces “srgb”, “adobe_rgb” Entry should be a 3-long numeric array of [r, g, b] values, scaled as a standard 8-bit representation of these color spaces (i.e., range [0, 255] values, gamma encoded). CIELAB “lab” Entry should be a 3-long numeric array of [L*, a*, b*] values (D50 white point). 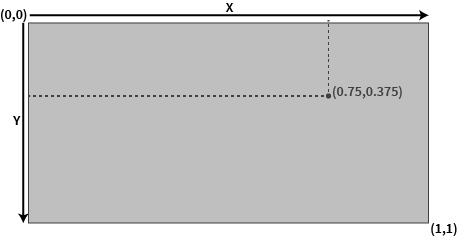 The L* value must be constrained to the range [0, 100]. Intensity values “density”, “intensity”, “intensity_8bit”, “intensity_16bit” Intensity values relative to a maximum of 1 after normalization. “intensity” input values are already normalized, and should be in range [0, 1]. “intensity_8bit” and “intensity_16bit” normalize based on a maximum of 255 and 2^16-1, respectively. “density” values are exponent values of the scheme 10^(-density). All value entries should be a single numeric value. Unfortunately, JSON files do not allow you to have comments in the file that are ignored by the parser. This means that if you are writing a JSON file and want to leave a comment documenting something for future users, you cannot do so by simply including escape characters such as “%” or “//” as is often found in most programming languages. However, if you need to comment your JSON file, you are free to add extra fields to any object in the file, for example with the name “comment” and a string value. Only required fields in a chart definition are checked for by Imatest- any extra fields are ignored. In most cases, chart-definitions are tied to both layout and media. After an Arbitrary Chart has been designed as a vector graphic (typically in Inkscape or Adobe Illustrator), the specific substrate and print medium needs to be considered (e.g, reflective and transmissive media will need two different .jsons, because the values of the color patches will be different). The Test Charts Module can be used to generate some vector graphics which can be used to compose a custom chart. As with all test charts, it is important to consider your imaging distance and minimum print resolution. Imatest offers professional printing services in a wide variety of substrates and sizes. For specific queries about creating a custom chart design, please contact support@imatest.com. We also offer consulting services for creating chart definition files, if required.